The competition will be tough but the meat should be tender at an upcoming pork pie contest. Up to 50 entrants from across the country will battle it out at the Old Bridge Inn, Ripponden, to be named maker of the best pie of 2007. The event organised by Ripponden’s Pork Pie Appreciation Society is expected to attract more than 300 pie lovers and raise £2,000 for Alzheimer’s charities. Society member Stuart Booth, of Outlane, said the competition had been running since 1992 but this year’s will be the biggest yet. He said: “It’s always a great day. “There have been entrants from Glasgow to Southampton and the judges panel can’t wait to get tasting. 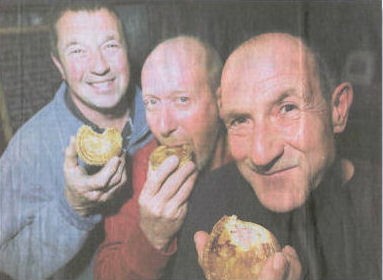 We are in search of the perfect pie.” The winner will receive £100anda silver trophy. Ten finalists will receive certificates of commendation. Elland Silver Youth Band will pro­vide entertainment and there will be hand-made pie displays by John Lord, of Bradford. Judging will take place in a mar­quee. One of the panel is last year’s winner Simon Haigh of Hinchliffe Butchers, Netherton, Huddersfield. Mr Haigh said: “The perfect pie will have a combination of thin pastry, tasty jelly and a palatable texture and filling. The key is attention to detail and appearance.” He said the competition, which will take place on Saturday March 24, was well regarded In the industry because it was one of the few which was run by consumers. The society was formed by Mr Booth’s brother Kevin and a group of friends who enjoyed a pork pie after a workout on Saturday afternoons in the early 1980s.